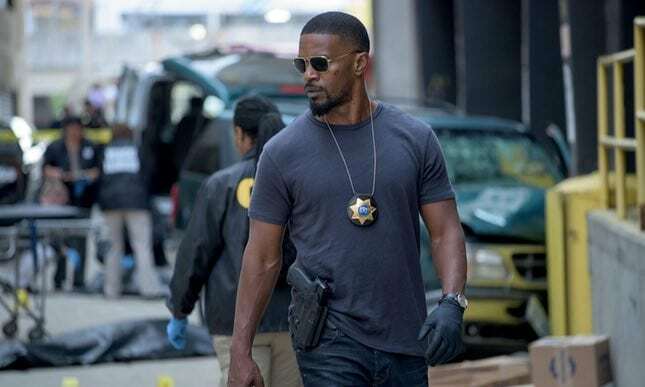 There is something rather familiar about the new Jamie Foxx vehicle Sleepless, and it isn’t just because the film has been adapted from a far superior French movie. What is familiar about it is its attempt at emulating the highly successful Fast and Furious franchise; it’s big, it’s noisy and has more guns and cars than you can shake a stick at. Yes, it is a predictable, and yes it is as hollow and as meat-headed a mess as you can expect, but despite all that, Sleepless does exactly what is expected of it. Fans of the genre will be delighted, unfortunately for the rest of us, and judging from the open ending, this could be the first film in a long and very lucrative franchise. Directed by Baran bo Odar (Who Am I, The Silence), Sleepless is based on Frédéric Jardin’s critically acclaimed 2011 movie Nuit Blanche and is fairly true to the original source material story-wise, if not as subtle. Las Vegas cop Vincent Downs (Jamie Foxx) and his partner Sean (Tip “T.I” Harris) find themselves mixed up in a deadly gang-war when they decide to rob a cocaine shipment bound for casino owner and big time crook Rubino (Dermot Mulroney). Things go spectacularly pear-shaped when Rubino kidnaps Vincent’s teenage son and holds him at ransom in exchange for the return of his pricey bounty. The whole thing gets doubly complicated when we find out that the drugs were bought and paid for by psychopathic drug kingpin Novak (Scoot McNairy), who has every intention of taking back what belongs to him. Throw in into the mix a pissed off badass female cop (Michelle Monaghan) with a pathological hatred for bent cops, and you have what could have potentially been a very interesting premise. With a promising screenplay from the usually brilliant Andrea Andrea Berlof (Straight Outta Compton, World Trade Centre), Sleepless sadly falls at the first hurdle by offering us characters that are simply not very believable. Add to that the ludicrously frequent and endless fight scenes, and all we’re left with is a film that is so clumsy that the comedy comes from the audience’s inability to take any of it seriously. Foxx does his usual shtick of manly bravado, but even he can’t rescue the story from looking just too far-fetched. The dialogue reads like something out of every single cop film you’ve ever seen, which is absolutely fine for a B movie, but with the pedigree available on the production side, one would perhaps expect a little more effort. On the whole Sleepless is an action packed production with nothing new to offer but with way more laughs, intentional or otherwise, than you bargained for. A fairly enjoyable 90 minutes of silly nonsense which is sure to do well at the box office. Sleepless is in cinemas from Friday May 5th. Competition: #Win A Sleepless pack with some great movie merchandise by tweeting us @TLE_Film with your favourite Jamie Fox Film. We have some great merchandise to give away, including branded glasses, a digital watch, t-shirt, keychain and a ripper wallet!!!! !